Record your memos or any audio signals offline, upload them to the cloud when you're online and access your recordings anywhere. Elegant and easy. Just press the record button in the app to start a new recording, you can then upload your recordings to SoundCloud.com. Optionally you can also share these with your friends on Facebook, Twitter, etc or via email. 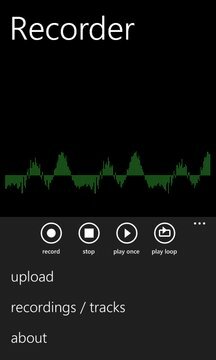 You can also listen to your locally stored (offline) recordings / tracks and those you uploaded to SoundCloud from within the app and also discover what other users publicly uploaded with the app. 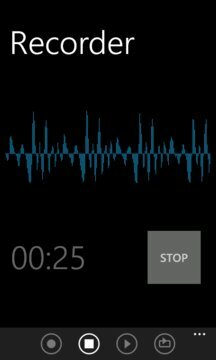 Make your Windows Phone to a dictating machine and access your recordings anywhere. It's great fun to listen to the recordings from other users and to share those. ★★★★★ "Clarity of recording is perfect! Great app." ★★★★★ "Works as advertised, and easy to use." ★★★★★ "Simple and effective, soundcloud integration is a very useful here. Can also share my records as well." There's also in-app feedback functionality to suggest new features, ask questions or report bugs.